iOS devices have the ability to detect shake gestures. In this tutorial we will show how to detect a shake gesture, and when detected a label text will be updated. This tutorial is made with Xcode 10 and built for iOS 12. For product name, use iOSShakeGestureTutorial and then fill out the Organization Name and Organization Identifier with your customary values. Enter Swift as Language and choose Next. Go to the Storyboard, drag a Label from the Object Library to the View Controller inside the Storyboard. Double-click the Label and give it a title of "Shake me". Select the Resolve Auto Layout Issues button and select Reset to Suggested Constraints. Go to the ViewController.swift file. First we need to make the View Controller respond to touch events. It can be achieved by making the View Controller FirstResponder. add the following method. 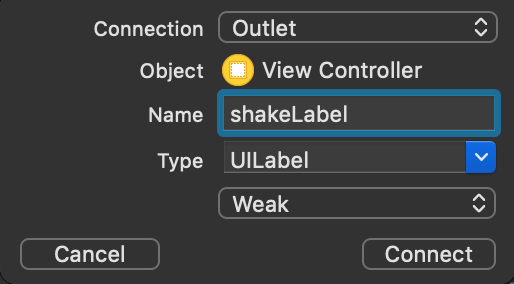 shakeLabel.text = "Shaken, not stirred"
If the motion is an Shake Gesture, then the Label text is updated. Build and Run the project and shake the device. Note with the iOS Simulator you can select the Shake Gesture in the Hardware menu. You can download the source code of the iOSShakeGestureTutorial at the ioscreator repository on Github.